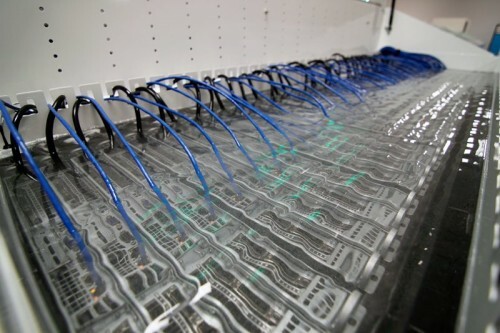 A few months ago I wrote an article about electricity use in data storage centres, and I want to continue on that theme today. This week Intel announced the results of a year long experiment that involves immersing computers in mineral oil to cool them. It turns out that the reason these centres use so much electricity is the need to cool the machinery. As this article points out some companies have had the brilliant idea of building their facilities in cold places, so that they can just leave the doors open or use cold seawater to cool the plants, but obviously this does not suit all business plans. Intel have been immersing their machinery in mineral oil in an attempt to save on electricity. Oil is a better conductor of heat than air so works more efficiently. You just have to remove the fans from the casings and drop the machines in. At the end of this 1 year experiment they found no problems in the machinery due to the immersion. Report in the article linked above. This certainly gives a whole new meaning to the idea of a think-tank. An organization called Sandia have another idea called a fan-less heat sink. This is a rotating wheel covered in fins that cuts out the use of the fan. They claim that this system is also much more efficient than the old fan system and is not affected by dust as the centrifugal force generated during its use throws it all out. There is an article explaining it here and for a technical explanation see their company website. If you want to go one step further how about laser cooling? Researchers at Nanyang Technological University have been working on this idea in the hope that they will be able to build microchips that actually cool themselves. Their press release talks about the end of compressors in fridges and air conditioners, a dramatic advantage in energy waste and an end to noisy fans. All published in this month’s Nature science journal. 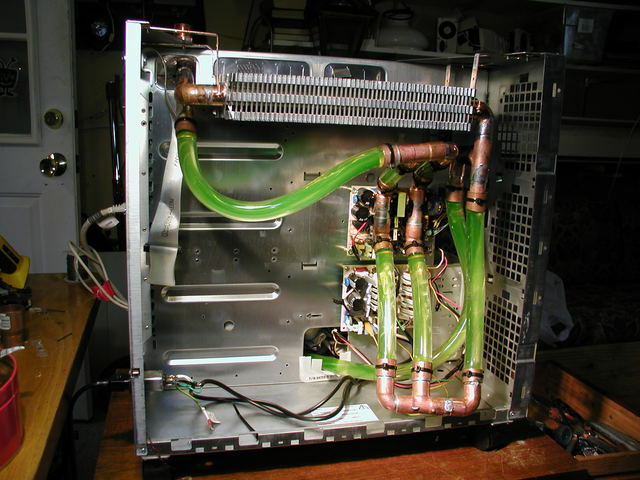 If all of this has wet your appetite you could try to convert your old computer to a water cooling system. Rather expensive commercially available solutions are available but this blog demonstrates how you can do it all in your own home using just a few things you can buy at your local hardware store. I would recommend that you do not use the computer you are using now though and that you save anything you might want to see again onto another hard drive! I take no responsibility for damage incurred. Just a few items from a hardware shop… oh and don’t forget your electrical work, welding and a bit of plumbing! For a normal PC, it seems like a massive waste of time, as overheating isn’t usually an issue, unless it gets really dusty – in which case, clean it! I wont be converting, but saying that, I have to admit that this does look really cool! http://www.vonslatt.com/images/cc31-fill.jpg – want one!!! If we can master cooling, match that with miniaturization (which is happening) and we are soon going to have some pretty powerful, portable PC’s! That is really interesting to read. It is a wonder how far this tech has come. It is great and many people don’t understand how important this is. The easier we can keep electronic cool, the better they will work and the longer they will last. Yes and the less electricity we will use.